LibreCAD-user - Open source CAM software? Can anyone suggest free or open source CAM software similar to the high quality of LibreCAD? Currently I am using CAMBAM which is really easy to use but I am running out of trail runs. The price isn't too bad at $150 but I am going to use about 1% of the features and won't use it all that often as a hobbyist. I tried FreeMill but it doesn't seem to work for me. The screen just keeps reloading. All I really need to do is to produce gcode from a dxf file but also be able to set tools, cut depths etc. Re: Open source CAM software? I was looking for CAM software a couple of years ago and my winner was dxf2gcode. But I still don't have the needs and so no experience with this or any other CAM tool. On their project page SourceForce recommends other CAM software like gcnccam (Gnu CNC CMA) or PyCAM. I think you have to compare yourself what fits best with your needs and environment. Thanks. I am familiar with dxf2gcode. Nice and simple. Perhaps too simple. For example you can't break the various entities into profiles like you can in CAMBAM. Looks like you might do it through layers. I guess that happens in the dxf. I still need to investigate layers. More important you can't set it to mill outside or inside the line like in CAMBAM. I will check the other suggestions. Thank you. dxf2gcode does have an option to enable Cutter Compensation. Cutting inside the line and outside the line is controlled by which code is used and the direction of travel. G40 cancels cutter compensation. G41 is left compensation and G42 is right. Lets assume you want to cut out a disc and the travel is clockwise. G41 would be selected and the cut would be on the outside or left of the line. This would leave you with a disk of the correct diameter. If you wanted a hole, use G42 to cut on the inside of the line. The opposite would be true with counterclockwise travel. Thank you so much for the insight into dxf2gcode. That is very useful information. What does the blue line mean when compensation is enabled? I assume it mans compensation but I am trying to figure out how the line designates which is which. Also whay would I pick one rotation over an other? BTW I did find a really nice fairly inexpensive CAM software called ESTL. Very easy to use. First there is an outline of the shape you are cutting which is black. At least on my machine it's black. The blue line shows the tool path. The offset caused by turning cutter compensation on and off is not shown on the screen but it does come into play when the gcode is generated. I don't use this often but when I do I have to go into the code and tidy things up a bit. The machinist's at work tell me that when cutting outside to go clockwise or to the right. Opposite for inside cutting. This would be for the rough cuts. When I get to within .05 to .08 is switch the direction of travel for a smoother finish cut. This will depend on how I want the finished piece to look. I don't know of a way for DXF2GCODE to do this so I have manually make the changes. The vast majority of work I do on the CNC is to locate holes in precise locations. About 90% I would guess. Then cutting slots and lastly cutting profiles. If this order were reversed, I would look into another package. Did they ever tell you wahy go clockwise over counter? Is it something to do with the rotation of the spindle? Any tips on engraving? What I am trying to do with the design posted above is engrave those numbers on the back side of painted plexliglass(the reason they are backward). I am getting mixed results. I have tried engraving nits and end mills So far the best results seem to be in with end mills (flat nose). But in the fure I am going to eant to engrave much more fine letters for a front panel. A form member on another forum takes his front panels to an engraver. He paints the plexiglass while (from the back. Engraves then paints black over what he engraved. I have seen photos. Very nice results. Not sure how he does it exactly. When cutting steel with the spindle turning CW and traveling to the right the bit will be making a cut that is pulling the bit to the right. The quill is also traveling to the right so that the force applied to the bit is lessened. This helps to reduce bit breakage but produces a rougher cut. With a CW spindle rotation and a leftward travel side force to the bit is increased. This also gives a smoother cut. The way it was explained to me is to think of the drive wheels on a car. As the wheels are turning the car is also moving forward. Now think of trying to push the car backwards while the tires are trying to push the car forward. Much more force is required to do so and the chance of breaking an axle is much greater. I understand why the smoothness of the cut is different between the two cuts but I don't really know how to explain it. I has something to do with the math of speed and distance, entry and exit point and other factors. This all really doesn't make a difference with plastics because they are so soft. For engraving is use a 1/8" 60 degree V carbide end mill. I will vary the depth depending on the size of the letters and material being used. I've never machined Plexiglass (also known as acrylic) but it is difficult to drill and chips easily. Polycarbonate is easier to drill and cut but is much easier to scratch. It's a tradeoff. Now for something I've never tried so I'm not sure how this would work out. 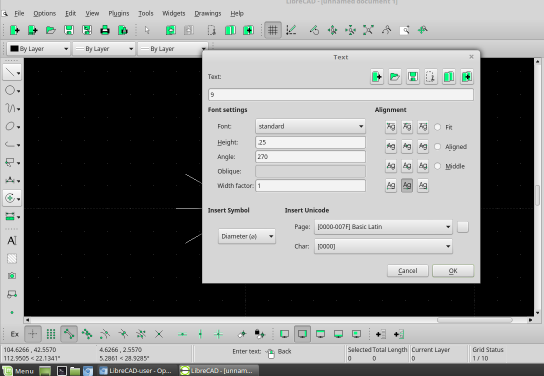 In LibreCad you can type a letter using MText or Text. Then select that letter, then use Explode to break it down into it's individual entities. Then use the Mirror command to make it read backwards. That part I know will work but this next one is a guess. 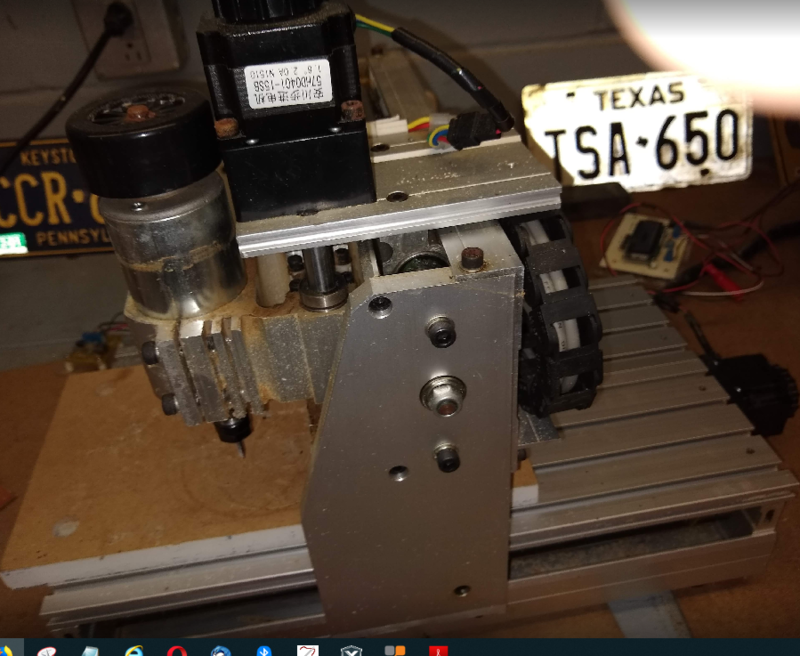 Use your gcode generator on this file to see if it will work. I did just that with LibreCAD. 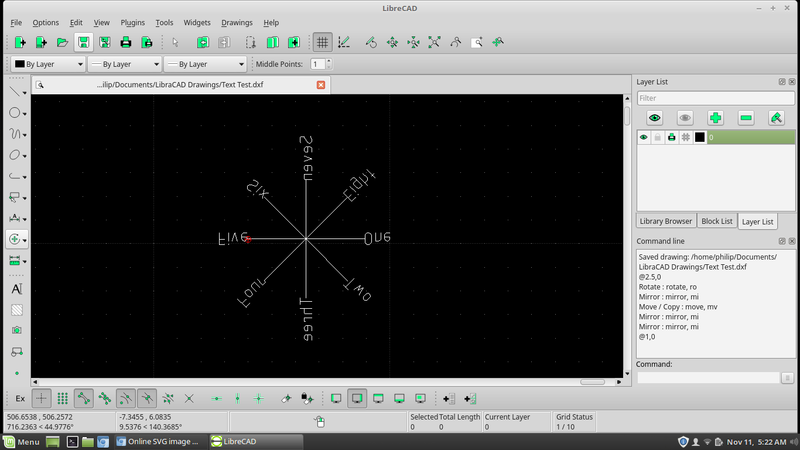 The text is how I got to using LibreCAD. Much more intuitive to use test over the other product. CAMBAM will read MText but does not interrupt it correctly. So yeah you need to explode. So what I did for above was to draw "compartments" in a circle using the array feature. 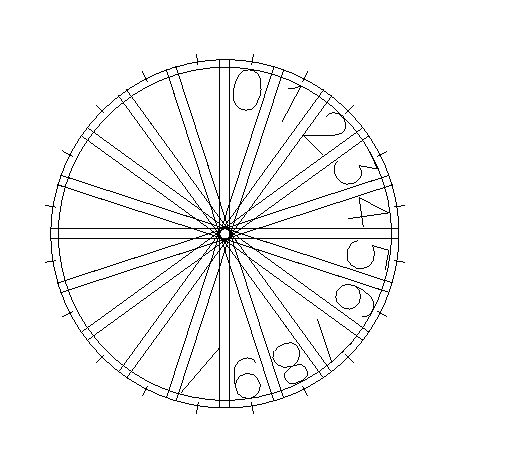 I added "tick marks" every 18 degrees in the center of the "compartment" to give me a reference to center the number. Since the tick marks were at 18 degrees it was easy to know how much to tilt each number, I then just mirrored the whole thing. What I was hoping for is something like the array feature but for a string of characters. Desk Engrave sort of does this but I have yet to figure out how to place the character at the degress I want. Otherwise really nice add on product to your collection..
You could also type just a single letter, then use the "Rotate" command, with multiple copies (19) and angle 18. Afterwards use "Properties" to change the letters or delete not needed ones. This doesn't take care of different letter spacings due to different letter widths, though. See. More than one way to skin a letter! I was curious as to how DFX2GCODE would handle text. It won't. Text must be exploded into the individual componets. I did that with with a test file and DFX2GCODE worked. I generated the code and ran it through a simulator I have. The code needs to be cleaned up but the end result is good. The letters came out as expected. When I made the drawing I made sure I used a font that was sans serif. 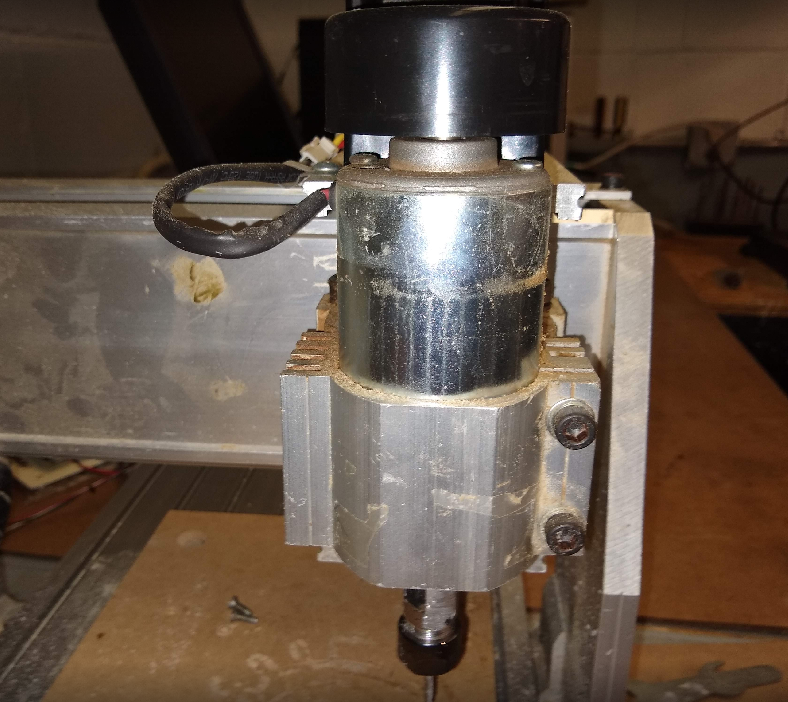 The end result, the bottom line, the long and short of it (pick one) is that what your are wanting to do can be accomplished with LibreCad and DFX2GCODE. Yes DXFtoGcode won't read the letters at all. They must first be exploded. You are better off anyway. Seems letters are not standard across various apps. Curious the CAMBAM app converts the stick font numbers to double lines. "Is this what you are looking to do? " Yes but with numbers and turned 90 deg from what you have it. Where you able to do that automatically or did you have to place the text? Here is how I did it. I had to place all the numbers manually. I then removed all of the extra alignment lines. First I drew a line with a line length equal to the radius of the circle I wanted. I think I use 2.5". 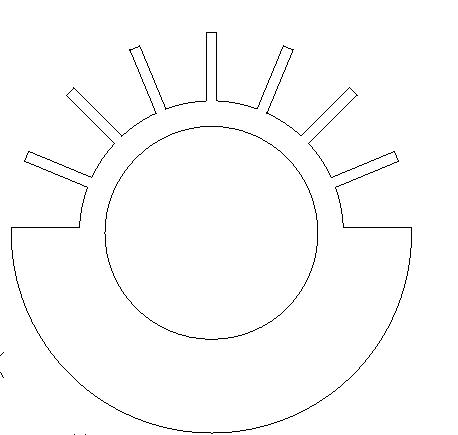 Then I used Rotate to create the spokes. I set Multiple Copies to 11 and angle to 30. This gave me the drawing below. After doing all this you will end up with drawing similar to the one below. Not automatic but not difficult either. A little time consuming. Then explode, flip and whatever else you need to do. I think you posted earlier that your text was 18 degrees apart. Might take a minute. Hope I was clear with this but ask if you have a question. The reason I did it the way I did it was to make sure the numbers fit inside these "compartments" that I milled out of 1/8" plywood. The difference between MText and Text is that MText is multi line and all the lines are treated as one entity. While Text can have multiple lines, each line is treated as an entity. Putting the characters in your template is certanily OK. It gives you visual proof of fit so you can size the characters accordingly. Many ways to accomplish the task you have presented. I'm sure you will make it work. Let us know how it goes and maybe post so photos of the finished product. What machine are you using to mill with? Perhaps nowdays there is more OpenSource (dxf2gcode is to simple for most work imho). One of those cheap Chinese routers. I wish the spindle holder was two pieces. Looks like it is milled out of one piece making sort of a clamp.